'Classical' econometric theory assumes that observed data come from a stationary process, where means and variances are constant over time. Graphs of economic time series, and the historical record of economic forecasting, reveal the invalidity of such an assumption. Consequently, we discuss the importance of stationarity for empirical modeling and inference; describe the effects of incorrectly assuming stationarity; explain the basic concepts of non-stationarity; note some sources of non-stationarity; formulate a class of non-stationary processes (autoregressions with unit roots) that seem empirically relevant for analyzing economic time series; and show when an analysis can be transformed by means of differencing and cointegrating combinations so stationarity becomes a reasonable assumption. We then describe how to test for unit roots and cointegration. Monte Carlo simulations and empirical examples illustrate the analysis. Technological progress is an important issue in long-term energy demand projections and in environmental analyses. Different assumptions on technological progress and diffusion of new technologies are among the reasons for diverging results obtained using bottom-up and top-down models for analysing the costs of greenhouse gas mitigation. 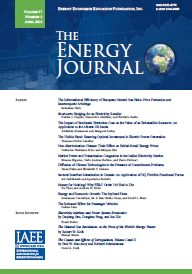 This paper examines the effect on aggregate energy efficiency of using technological vintage models to describe technology diffusion. The focus is on short- to medium-term issues. Three different models of Danish energy supply and demand are used to illustrate the consequences of the vintage modelling approach. The fluctuating utilisation rates for power capacity in Denmark are found to have a significant impact on average fuel efficiencies. Diffusion of electric appliances is linked to economic activity and saturation levels for each appliance. In the sector of residential heat demand, fuel price increases are found to accelerate diffusion by increasing replacement rates for heating equipment. We measure the effect of incentive payments on residential time-of-day (TOD) electricity demand in summer, using data from a residential TOD electricity pricing experiment in the Kyushu region of southern Japan. During the experiment, participating households could receive incentive payments if they reduce their peak usage share. Results based on an econometric model indicate that households have shifted their electricity usage from peak to off-peak periods in response to the incentive payment, but the effect of the incentive payment on load shifting was modest. This paper considers the design, incentives and effectiveness of U.S. demand side management (DSM) programs and tries to explain why this ambitious, almost unanimously embraced initiative failed. Problems on the demand side result from consumers' private information that implies that substantial principal-agent slippage must accompany any conservation incentive the utility offers to the consumer. Moreover, the regulatory incentives induce the American utility to select inefficient programs. Therefore, the utility has little to gain from deterring such strategic reactions and cheating by consumers. As a consequence, the reported conservation exists largely on paper but not in reality. This ex-post assessment is important for two reasons. First, European countries (Scandinavia, Germany, Austria and others) have been eager to repeat this American regulatory 'success'. Second, the problems addressed in this paper would apply to another round of conservation programs induced by the concern about global warming. Over the last 20 years, the offshore exploratory success rate has more than doubled for a group of large producers which includes Exxon, Shell, Mobil, and Texaco, according to the U.S. Energy Information Administration (EIA). It is tempting to conclude that this increase can be attributed to the many advances in seismic and drilling technologies that have occurred over the same period. However, such a conclusion may be premature given that much of the increase in the success rate occurred in the late 1970s and early 1980s, well before the major advancements in seismic technology. The conclusion may also be premature in that it ignores the relationship between price and the success rate. Increases in the price may positively (negatively) affect the success rate. Given this, and the decline in price over the past decade, one would expect the success rate to have declined (increased) in the absence of technological change. This paper develops an econometric model that attempts to disentangle and quantify the effects of the major factors hypothesized to affect the offshore exploratory success rate. The analysis relies on company level data from the EIA's Financial Reporting System over the period 1978 through 1995. Despite the development of an international market for crude petroleum and the resulting opportunities for arbitrage, Saudi oil continues to be shipped to markets in the U.S. and Europe when closer markets are available. Furthermore, these Western sales take place at fob (Saudi Arabia) prices that are lower than for exports to customers in the Far East. This note explains these Saudi price and trade flow anomalies in terms of a model of constrained price discrimination in which the quality adjusted price differential between Asian and European prices cannot exceed the differential in tanker rates to the two markets. The conditions under which price discrimination is likely to continue are also explored. The focus is on the West European and Far East oil markets but the argument applies to the U.S. market as well. Implications of Saudi marketing practices for new oil producers such as those in Central Asia are also discussed. Where gas and hydro are not available and power capacity needs to be expanded, the choice will be between coal and nuclear, for there are few viable alternative options. This paper analyzes the factors that will determine the choice. The internal costs of power generation using coal and nuclear show no clear edge for one or the other. A tilt in favor of nuclear emerges when the external costs, as assessed by experts in the field, are added to the internal ones. Laymen's evaluations of the external costs appear to be at least an order of magnitude higher than the expert assessments, however. Given their high level and strong influence on energy policy making, these evaluations will ultimately determine the choice. But since the laymen's views in this regard are formed in an unsystematic manner and are unstable over time, it is not possible to use economic analysis to determine what that choice will be.